Sunday January 16th 1881 I did nothing but work around the house till after dinner. In the afternoon I went to town in the sleigh with Rob. We brought Winnie back with us I wrote to Mrs Dennison and Effie Stone in the evening. 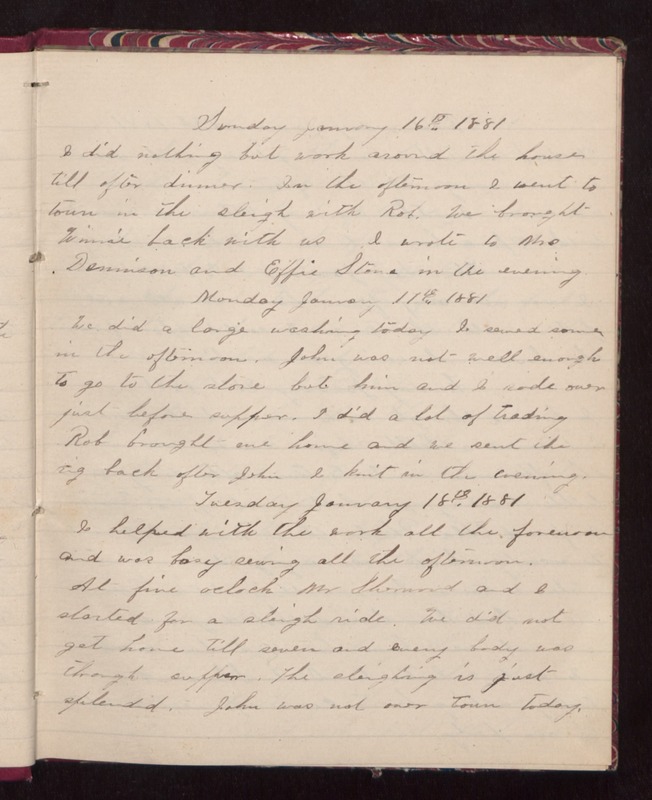 Monday January 17th 1881 We did a large washing today I sewed some in the afternoon. John was not well enough to go to the store but him and I rode over just before supper. I did a lot of trading Rob brought me home and we sent the rig back after John. I knit in the evening. Tuesday January 18th 1881 I helped with the work all the forenoon and was busy sewing all the afternoon. At five oclock Mr Sherwood and I started for a sleigh ride. We did not get home till seven and every body was through supper. The sleighing is just splendid. John was not over town today.